Ideal for fluffing, detangling and removing dead hair. Hardened steel teeth are drilled into the solid brass steel-plated spine. Hardened chrome plated steel teeth are drilled into the non-slip solid brass spine, for a better grip, ease and years of use. These Master Grooming Tools were designed by groomers specifically to increase comfort and reduce the risk of injury. Versatile combs are an essential tool for fluffing, detangling, and removing dead hair from medium to longhaired dogs and cats. These all metal Master Grooming Xylan Tools are coated with Xylan to decrease friction, reduce static, help prevent fly-away hair, and increase chemical and wear resistance. 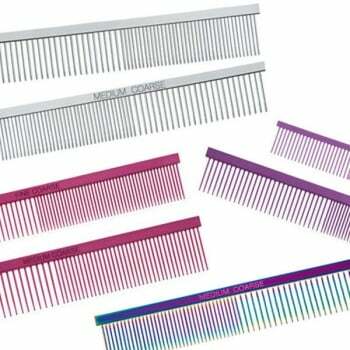 The European-style Master Grooming Tools Rainbow Grooming Combs are constructed from steel and feature a shimmering coating that produces a fashionable, rainbow-like effect.